A Superbill is a fancy word for a receipt. It's commonly used as a record of sessions, diagnosis and payments in order for a patient to submit to their insurance company for reimbursement. While a Superbill seems like it should be in the Money section, in iCouch, you'd actually create this within your Papers section. This article explains how to do it. 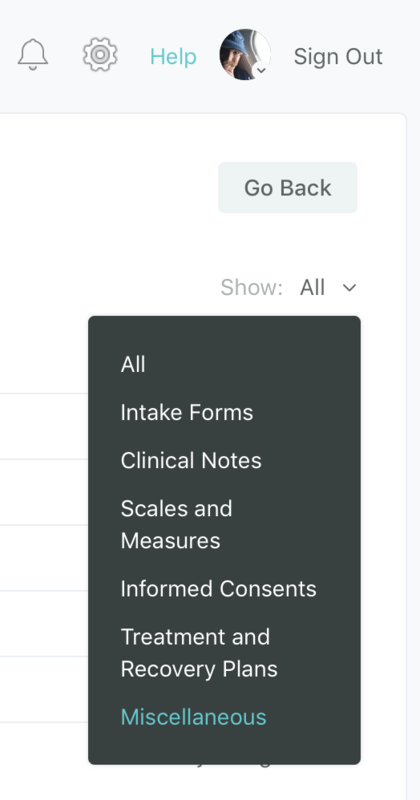 First, visit your Papers section by clicking Papers on the left side menu when you are signed into your iCouch practitioner account. Next, you're going to click on Form Template Manager in the top left of your Papers section. Next, you'll need to get the Superbill template from the iCouch Form Library. You get there, by clicking on the iCouch Form Library button in the top right of your Form Template Manager. Select "Miscellaneous" as your option. This will filter the iCouch Form Library items and you should see Superbill listed. This will load a preview of what the template looks like. Don't worry, you can fully customize this later if desired. This is just the basic template in our iCouch Form Library. In the top right, there's a button, "Copy to My Templates." Just as it sounds, clicking this will copy this to your form templates. Once it's copied into your account, it's "yours" -- you can edit it however you like. But first, click Copy to My Templates to copy it over. Now you're going to be in the editing view of the template. It's now yours. You can edit it however you want. If you need help with that, read Creating a Custom Form to learn more about how to edit/create form templates. If you are happy with your form template, click the Save button on the top right of that page. Now you can use this template like you would normally. If you need a refresher on how to use form templates, read How to Complete your Own Forms for step-by-step instructions. And, as always, reach out to us for help! Click the chat icon in the bottom right of any iCouch page to start a conversation with us. We're happy to help you customize form templates and provide complete, customized assistance for you! Sharing a completed Superbill with a client is similar to sharing anything else with a client in iCouch. However, unlike sharing blank forms for your clients to fill out, you'll want to share the completed Superbill. You'll do that sharing from the main Papers section. Remember, to share a Paper with a client, they'll need to have been invited to iCouch first. Go to Papers by clicking Papers in the left sidebar. Click Actions in the top right, then select Share. Assuming your client has a client portal account, select the client's name from the resulting dropdown list. Once the paper is shared, your client can sign into their account, view and print the Superbill. Let us know in the chat if you have any questions! We are glad to help.